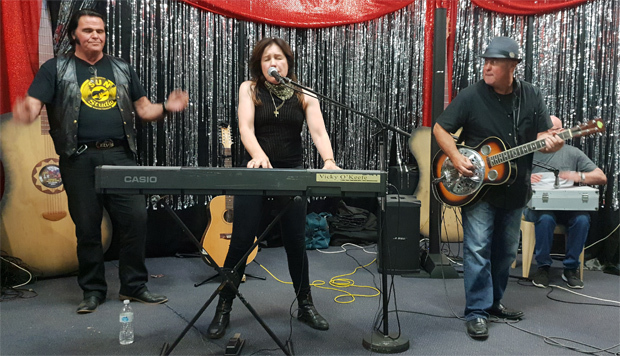 Rockers at this year’s The Waterhole Rocks in Nanango enjoyed a surprise on Friday night … a star turn on stage by Vicky O’Keefe, daughter of Aussie legend JOK. There was no pre-publicity for the visit. 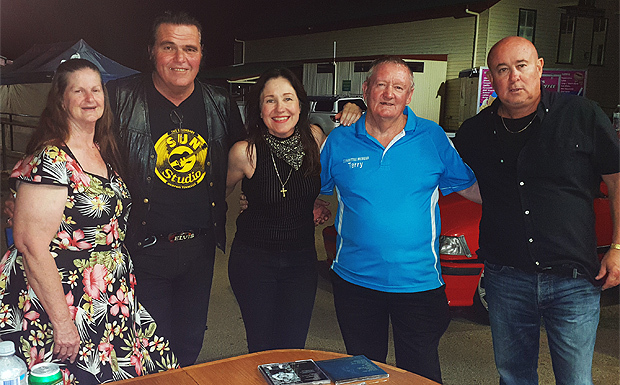 Organisers wanted loyal regulars at The Waterhole Rocks to be rewarded with the special bonus of meeting the daughter of “the Wild One”, Johnny O’Keefe. Vicky was just 17 when her famous father died but since then she’s carved out a music career of her own, writing and singing her own songs as well as performing tributes to her dad. 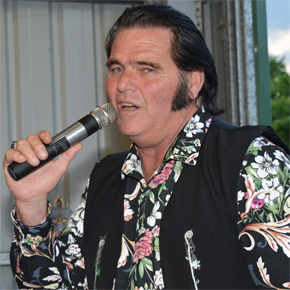 The South Burnett’s own Elvis, Jeff Hancox, joined Vicky and her guitarist Glenn Heffernan on stage to rock out some JOK favourites in a one-hour tribute gig. Vicky also took time out to mingle with fans and sign autographs. 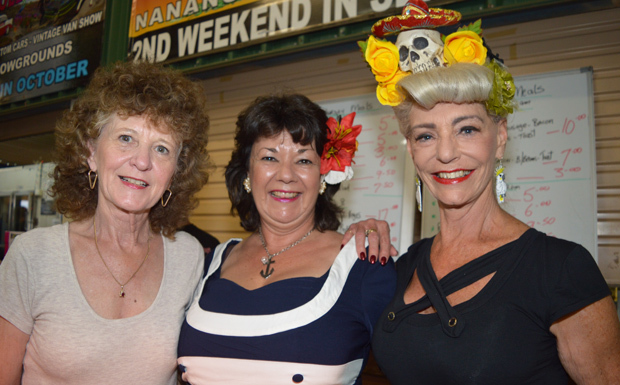 More than 330 caravans – which means at least 600 people – camped at Nanango Showgrounds for this year’s four-day celebration of everything 1950s and 1960s. 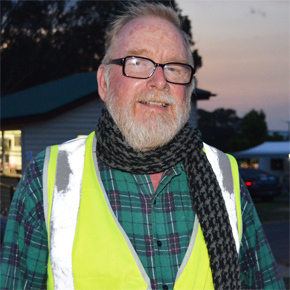 Festival organiser Terry Mackrell, from the South Burnett Gas Guzzlers, said he was delighted with this year’s roll-up, which exceeded last year’s van numbers by roughly a third. 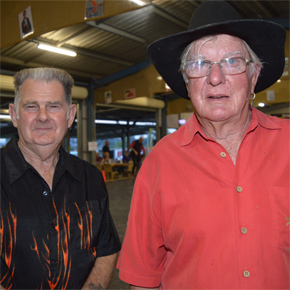 He was also astonished at the turn-out to an informal pre-festival meet and greet barbecue the Gas Guzzlers held at their clubhouse, which drew well over 100 guests on Wednesday night. 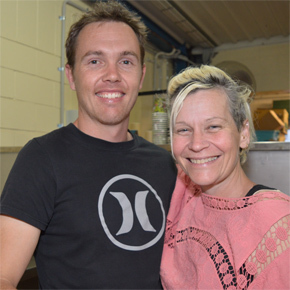 “We thought we’d introduce this as a new thing this year, and expected we might get 40 or 50 people,” Terry said. “But as things turned out, we were run off our feet with more than double that number. Numbers at the annual Fashion Parade – another new feature introduced several years ago – were slightly down this year, but the quality of the impeccably dressed entrants was very high. And as is the case every year, the special dance floor was packed with eager rock’n’roll dancers. 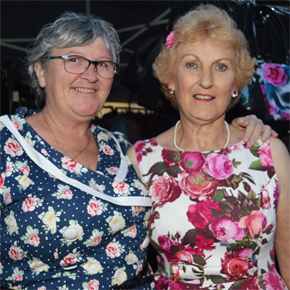 The dance floor – and an extension to it added a few years later – were funded by Nanango’s Heritage Community Branch and are intrinsic to the event’s success. Each year the floor is laid in preparation for the festival then pulled up and stored securely for another year after it concludes. “Serious rock’n’roll dancing needs a seriously good dance floor,” Terry said. “A big part of the reason we get so many people from all over south-east Queensland is because the festival’s dance floor is so good. “In fact, over the years many people have told us it’s the best they’ve ever been on. 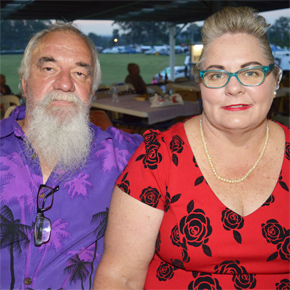 Terry said this year’s musical entertainment included some bands that had been popular crowd-pleasers in previous years, as well as several new bands which also performed to a very high standard. “We tend to attract a discerning audience and over time we’ve unearthed some really incredible performers who’ve become regulars on the festival program,” Terry said. This year’s festival also helped raise money for a local good cause. 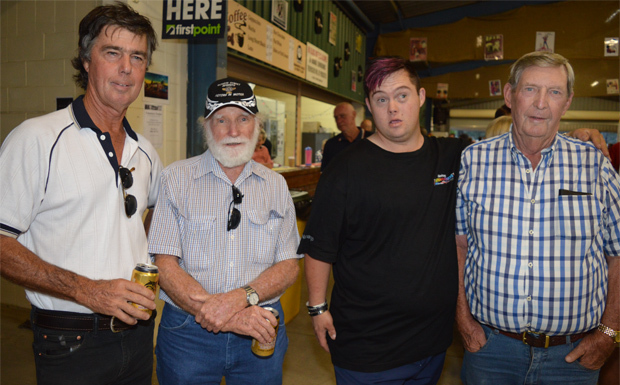 Waterhole Rocks was Stop 1 on a special three-stop Nanango entertainment promotion – “Saturday Night Live” – which also included Nanango RSL Club’s inaugural Oktoberfest plus “Rock On Palace” at the Palace Hotel with Brisbane band Black Smoke. The three venues collected donations for the town’s proposed Butter Factory Park inclusive playground.